I finished high school in Iran and I got diploma in math and physics (1998). 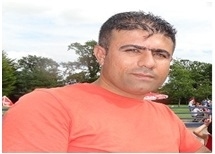 I received my Bachelor in math from Sallahaddin University (2004) and I spent two years as teaching assistant in college of science then got master in math from Sallahaddin University(2008) , then moved to Soran University as Assistance Lecturer in 2009. Now, I am a PhD student in University of Plymouth. - Rostam K. Saeed, Hassan M Sdiq, ‘’ Solving a System of Linear Fredholm Fractional Integro-differential Equation Using Homotopy Perturbation Method’’, Australian Jurnal of Basic and Applied Sceince, 4(4): 633-638, 2010. -2-day Short course on SPH, University of Manchester, January 2014. - 10th International SPHERIC SPH Workshop, University of Parma, Italy, June, 2015.